There is little doubt in this mind that the GDP number will be revised lower, and the chain deflator lowball will prove to be transitory, and the recovery will be ephemeral, at least based on real numbers. The Clunkers programs pulled sales forward, which is a useful thing only if there is the follow up of systemic reform. The consumer is flat on their back, and median wages and employment are going nowhere. One can stoke monetary inflation with enough Fed expansion, but without the vitality that bestows permanence and self-sufficiency. 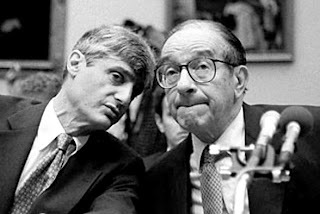 A reader sent in this prescient warning from 1995, when then Treasury Secretary Robert Rubin, late of Goldman Sachs, mentor to Larry and Timmy of the current US ship of state, wanted to unleash the power of the big money center banks to ensure their "efficiency and international competitiveness." If only the US had rejected the Rubin - Greenspan doctrine then, and firmly said no to freewheeling finance, and not succumbed to the hundreds of millions of dollars in lobbying and donations spread about Washington in that 1990's campaign by Wall Street that culminated in Fed preemptive action, followed by a massive lobbying campaign led by Sandy Weill. One might be tempted to conclude from this that they bought the attention of the Congress for their agenda then, and based on additional substantial contributions, have held it ever since. As you may recall, it was in December, 1996 when Alan Greenspan made his famous 'irrational exuberance' speech. And then shortly thereafter laid the groundwork for the tech bubble of 1999, and the series of bubbles that are the basis of the American economy even today, and the long twilight of the US dollar. Based on our read, the financial reform plans crafted by Tim Geithner, Larry Summers, and their friends on Wall Street is merely a continuation of the Rubinomics. Is there any wonder, as we have Rubinomics Recalculated by Obama. Thanks to Mark for sharing this on a day in which I had not intended to post anything. There seem to be about 12,000 regular visitors to Le Cafe each day. Although this is not a lot by internet standards, I have to say that based on their valuable comments and exceptionally well-informed messages sent in by email, that when it comes to astute readers, we have an embarrassment of riches. And for this we give thanks and are grateful. Re "For Rogue Traders, Yet Another Victim" (Business Day, Feb. 28) and your same-day article on Treasury Secretary Robert E. Rubin's proposal to eliminate the legal barriers that have separated the nation's commercial banks, securities firms and insurance companies for decades: The American Bankers Association, Senator Alfonse M. D'Amato, Representative Jim Leach and Treasury Secretary Rubin are gravely misguided in their quest to repeal the Glass-Steagall Act. Their contention that insurance companies, commercial banks and securities firms should be freed from legislative obstructions is predicated on fallacious, historically inaccurate statements. If the Baring Brothers failure does not give them pause, a history lesson is our only hope before the Administration and bank lobby iron out their differences and set the economy back 90 years. The argument that American financial intermediaries will become "more efficient and more internationally competitive" is false. The American financial system is the most stable, most profitable and most dynamic in the world. The notion that Glass-Steagall prevents American financial intermediaries from fulfilling their utmost potential in a global marketplace reflects inadequate understanding of the events that precipitated the act and the similarities between today's financial marketplace and the market nearly a century ago. Although Glass-Steagall was enacted during the Great Depression, it was put in place because the Aldrich-Vreeland Act of 1908, the blue-sky laws following 1910 and the Federal Reserve System of 1913 failed to keep the concentration of financial power in check. 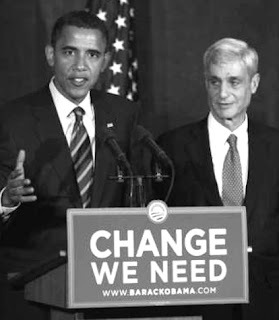 The investment climate that ultimately led to Glass-Steagall was one filled with emerging markets, interlocking control of productive resources and widespread bank ownership of securities. Ever since railroad securities began driving secondary capital markets in the late 1860's, "emerging markets" have existed for investors looking for high-yield opportunities, and banks have been primary agents in industrial development. In the 19th century, emerging markets were scattered throughout the United States, and capital flowed into them from New York, Boston, Philadelphia and London. In the same way, capital flows from the United States, Japan and England to Latin America and the Pacific rim -- today we just have more terms to define the market mechanisms. The economy and financial markets were even more interconnected in the 19th century than now. Commercial and investment banks could accept deposits, issue currency, underwrite securities and own industrial enterprises. With Glass-Steagall lifted, we will chart a course returning us to that environment. J. P. Morgan and Andrew Mellon made their billions through inter locking directorates and outright ownership of hundreds of nationally prominent enterprises. Glass-Steagall is one crucial piece of a litany of legislation designed to place checks and balances on the concentration of financial resources. To repeal it would be tantamount to bringing back the days of the robber barons. The unbridled activities of those gifted financiers crumbled under the dynamic forces of the capital marketplace. If you take away the checks, the market forces will eventually knock the system off balance. The writer is a management consultant specializing in business history.